Tucked away at the entrance of Hammond's Ferry, a new urbanist community in North Augusta, SC, you'll find a project from Manuel Verney-Carron called Hammond's Ferry Larder. Hammond's Ferry Larder, or HF Larder, as it's affectionately known, offers lunch and dinner options with brunch on Saturday mornings. My husband and I have been dining at the location since it opened over a year ago but I decided to take my sister to check out their newly revamped menu for fall. I've been promising her a brunch date for a while now. We chatted with my friend Davis and listened to smooth jazz tunes while we waited for our food. If you haven't caught on yet from reading my blog, I'm a huge fan of breakfast foods. I had my regular, the Breakfast Crack, an egg, avocado, Swiss cheese, and jalapeno bacon sandwich on multigrain toast while my little sister opted for the lox and bagels. The jalapeno bacon is to die for! You can get in and out for under $10 if you hit up the breakfast menu on the weekends. The Hammond's Ferry Larder brands itself as a neighborhood pantry + deli + bar. When you walk in the door you can see why! You're greeted by goodies that would be perfect for a culinary-themed gift basket. 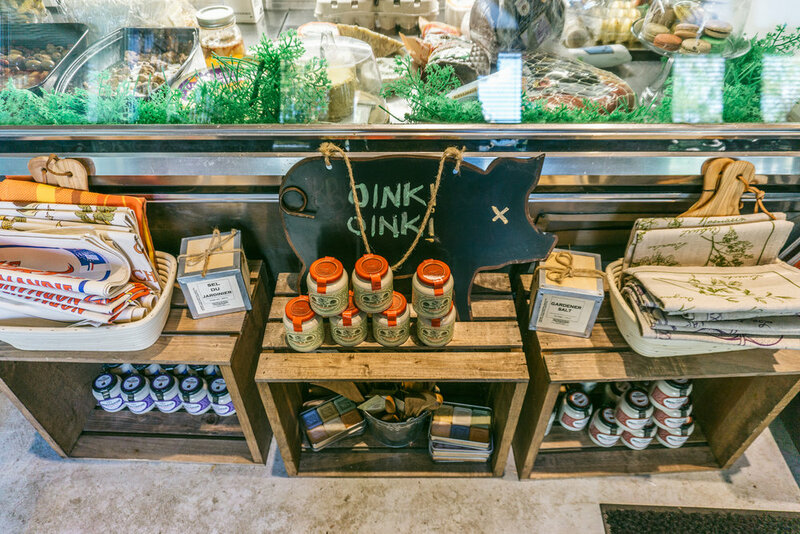 They've got everything from truffle salt to mustard and olives to pickled okra. HF Larder is also the only place I know of in North Augusta that sells King of Pops! Next time we'll have to try out the build your own Bloody Mary bar. I'm not a huge fan of tomato juice but the display was almost too cute to resist! This is quite possibly the only restaurant in town that reminds me of our years spent in Charleston. Having lived in a foodie town for a while, it's hard to even come close to what we're used to but the Hammond's Ferry Larder hits the mark. With its relaxed atmosphere, cohesive branding, and affordable prices, it's definitely a gem! If you're planning a trip to the Augusta area for Master's Week next year, be sure to check them out.